I’ve been eagerly awaiting the launch of this new themeless series for the past month or so. Mr. Collins is a man on a mission—trying to make low word-count themelesses that are smooth and contemporary and highbrow and lowbrow all at once … it’s a tall order. Let’s see what’s up. I got the long answer FOODBABIES immediately thereafter, off just the initial “F” (22A: Bumps after big meals). This is a weird way for me to open a themeless—spanning the grid with very little help from the short stuff. I was actually stunned when both SARONG (30D: Cover-up at the beach) and GO AGAINST (47A: Counter) worked immediately. Got worried that this thing might be too easy, but time and again, the shorter stuff actually slowed me right down. I finally got my footing in the NW and proceeded more or less methodically and conventionally from there. And there was a lot to love here. Not much junky short stuff, and what there was was often redeemed by new or interesting clues. 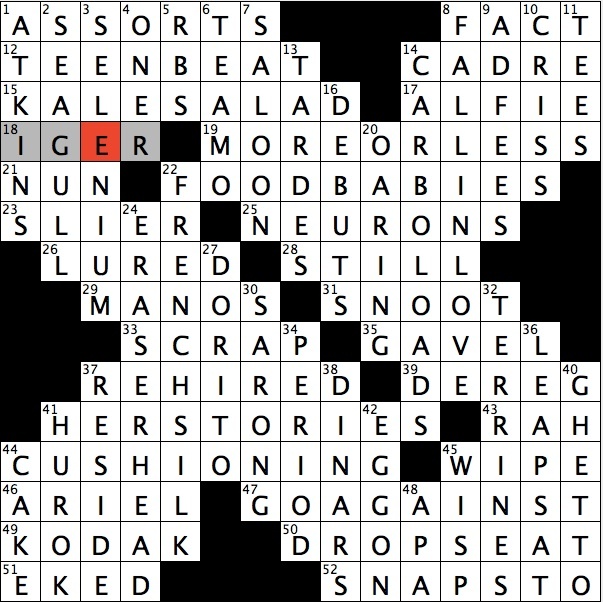 Really liked the APA clue, for instance (48D: Medical org. known on campuses for its style). Nice ambiguous use of “style” there (APA publishes a *writing* style guide, btw). Singular DORITO gets an apt, if unappetizing, clue (27D: Taco shell option at Taco Bell). TE AMO gets a “?” clue that should be a double-“?” clue, its slyness is so deep (6D: Bit of romance language?). “Romance” = “I love you,” but “Romance” also = the “romance language” the answer is in, i.e. Spanish. Cool. The puzzle is also drenched in solid longer answers. The whole large NE section is really marvelous in every way. I love how CARBOLOADS is taunting ATKINS there on the other side of the grid. I also love that DEBUTS is in this puzzle series debut. I wonder if the logic behind easy longer answers (GHETTO took zero thought at all, for instance) (40D: ___ blaster (boom box)), is that it will make the puzzles accessible for those who often don’t make it to the themelesses on Fri and Sat in the NYT. I don’t know. This definitely felt … if not easy, then definitely doable. This is a good thing, even if I felt like I was getting too much for free in the long answer department. I think the film stuff gets a little Inside Baseball (film studies Mr. Collins’ thing, so it’s not surprising). The IGER / ONER intersection ended up being a fail for me. Actually, I remembered that definition of ONER from a youtube video of ONERs I saw last year sometime, but [Pixar poacher] for IGER was beyond me. I figured there was some character in a Pixar film who was a poacher, and his name was … IGOR. So I had SELONIUM, which is absurd, but the clue was sciencey enough that I just chalked SELONIUM up to my sci-ignorance. 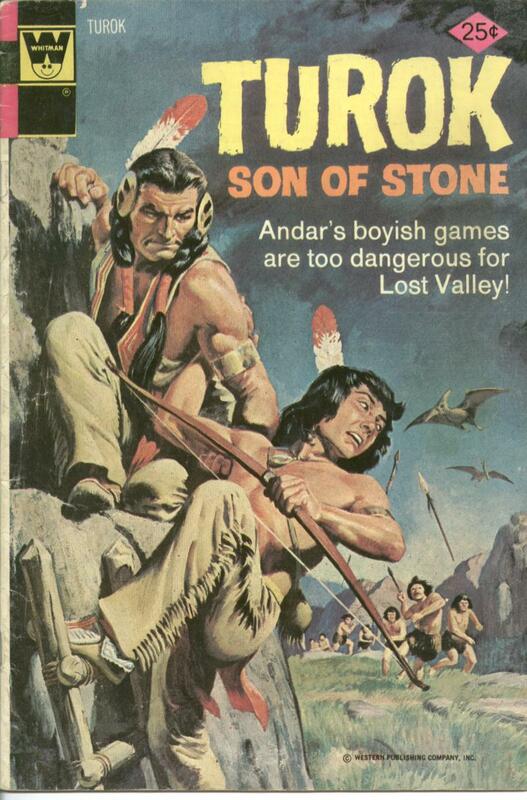 I *though* my error was down in the HUROK (!?) / EKED (??) / CAKE (?) area. I really, really guessed there, having no idea about that def. of CAKE (44D: Booty), and not knowing HUROK from TUROK, and being accustomed to seeing the “out” in EKE-type clues inside of parentheses, not free-roaming as it was here (51A: Barely got out). But no. I was good there. Died at IGOR. To my credit, I figured out that’s where the error was. But I still consider that a Miss. Oh well, I get another stab at HIGH:low in another couple weeks. Can’t wait. I’ve said it before and I’ll say it again: KAC is the hero the cruciverse deserves. I’ve counted ONER among my most loathed crosswordese for years, but this definition, which was totally new to me, completely redeems it. Welcome back to my wordlist, ONER. Oh, this puzzle? Very sweet. How do I get the email notification that I signed up for? Dan, what’s your address? I’ll add you. In case you already did sign up, it was a little tough for me to find it in Gmail. It got filtered into my Promotions box for some reason. It’s this username @ hotmail. Thanks! Thanks friends!! Can someone please confirm for me that FRENCH SILK pies are yummy? 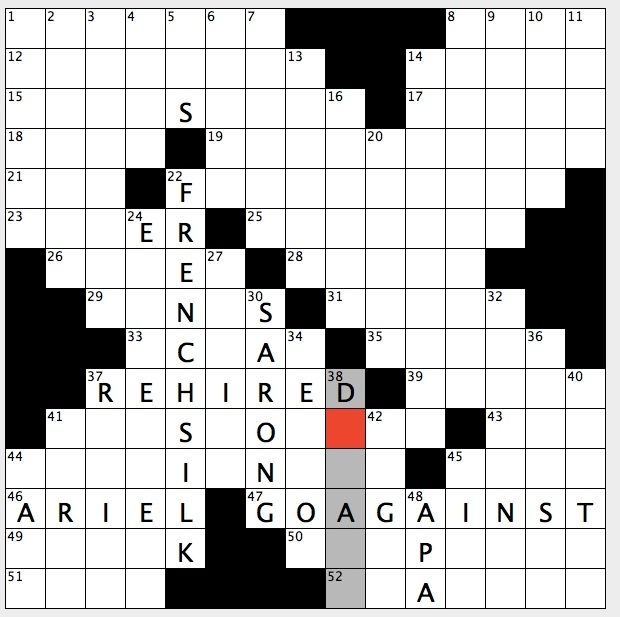 I’d be super remiss (as I was yesterday in my newsletter) not to mention that this puzzle would be much worse off without the help of my Copy Editor / Brand Manager / Life Coach Mr. Eazy-E Agard, aka Eric, who has to put up with my daily questions, drafts, and shade. And also Michael and Amy Reynaldo for your support and RTs! I can confirm. My dad used to get them a lot when I was kid. Speaking of desserts: this was the cake-cutting song at my wedding that allowed me to understand why CAKE is a synonym for booty. You may think I’m kidding. YOU WOULD BE WRONG. I have given up on French silk pie now that I know Hoosier Mama Pie Company’s chocolate cream pie, which is the GOAT. You come to Chicago sometime, we’ll go to Hoosier Mama and you will have issues with everyone else’s lesser pies. I found this comment in the spam folder! Why! Is it because you’re sellin’ pies? And dissing on lesser pies? That should say Erik*, but that’s what he gets for always using my words against me as puns. I liked it. It was definitely doable for someone like me who does not solve a lot of themeless puzzles. And FRENCH SILK pie is indeed delicious! Great stuff here. Really enjoyed it! Just signed up to make sure I don’t miss the next one. Too many factoids I didn’t know (clues included of course) for me to enjoy it or consider it a good puzzle. I can tell you, right off the bat, that you’ve got a loyal solver already. Not because it was a good puzzle (although it was – really excited to see the David Lynch clue, because I had to think for a while on that one, and FOOD BABIES is a great, fresh entry), but for a silly, personal reason. See, the first word of the answer to 15-Across is my surname. No big deal, I solve a lot, happens once a month or so. But it crosses 1-Down at the K… and 1-Down happens to be the surname of my fiance. What are the odds!? Sorry so late, but just got around to solving #1 this weekend, and, it’s the best themeless I’ve solved in 6 months! Awesome puzzle. [impulsive networkers] is divine for NEURONS, as are the clues for ‘cushioning’ and ‘teenbeat’. Looking forward to the next.